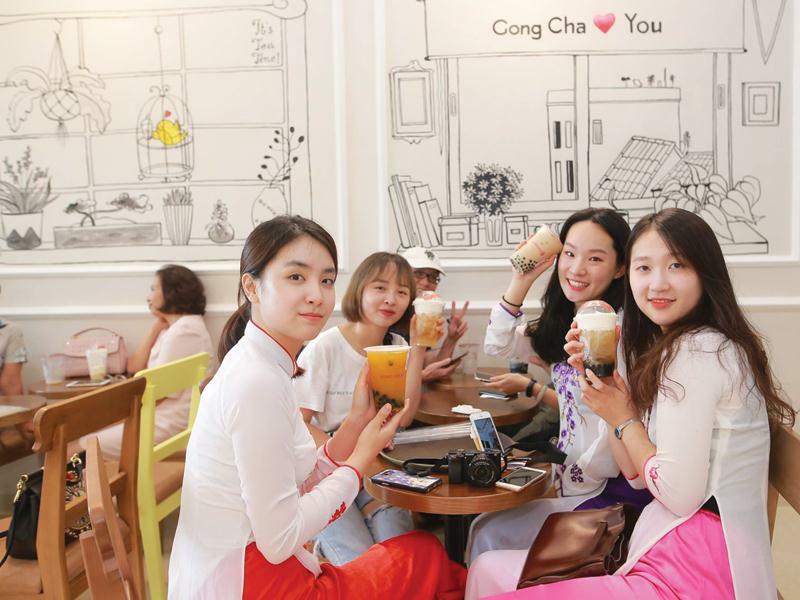 The milk tea market is heating up day by day as a number of foreign giants have been opening franchise stores in Vietnam, reviving the trend that once hyped up the beverage market. More than three years ago, the family of Nguyen Hoai Phuong, a young businessman in Ho Chi Minh City, decided to join a new area of business—opening a Taiwanese milk tea franchise in Vietnam. “Seeing young people in Taiwan, South Korea, and Singapore line up to buy these cups of tea, I could imagine a similar picture in Vietnam. It made me want to bring the Taiwanese tea brand Gong Cha to Vietnam,” Phuong said. Afterward, he tried to make direct contact with Royal Tea Taiwan Co., Ltd. (Gong Cha) and the founder of Gong Cha. “It took me about six months of talks and negotiations with Royal Tea Taiwan, as well as arranging several face-to-face discussions with the CEO of the company on our capabilities and business plans in Vietnam,” Phuong said. In order to become the master franchise of the famous milk tea brand Gong Cha across the entire territory of Vietnam, besides meeting all the strict requirements on financial capacity and business planning for developing the Gong Cha brand name and products in the long term, the Vietnamese candidate had to satisfy a special request Gong Cha put in before signing the franchise contract. Accordingly, the main shareholders and the executives of Gong Cha Vietnam were requested to travel to Taiwan and live at Gong Cha's headquarters for two months. They first learned how to make milk tea and then visit the milk tea shops on the streets of Taiwan to understand how tea would be sold and stored and the staff would be managed. At the end of the course, after learning how to make milk tea in Taiwan, everyone had to pass a writing exam and a practice test of making milk tea to be certified as satisfactory and eligible for operating the franchise. After that, the new franchise contract was officially signed. This clearly proves that financial capacity and experience might not be enough without passion and determination. Originally born in Taiwan, Gong Cha has been developing under the franchise model in foreign markets, especially in Asian key markets, such as South Korea, Singapore, the Philippines, and Malaysia, and North America, such as the US and Canada. Particularly, there are more than 1,000 Gong Cha outlets in South Korea. Phuong was deeply impressed with Gong Cha’s business model. The brand imposes strict regulations on quality and food hygiene. They also have their own recipes for each drink, making sure they are suitable for all tastes, especially that of young people. For example, customers can choose from a variety of teas to suit their tastes. They can then choose to add white or black pearls, aloe vera cubes, grass jelly, and red beans, among others, to the tea. Finally, they can choose the amount of sugar and ice in their cup of milk tea. With the family’s experience in operating restaurants and eateries in Ho Chi Minh City and Hanoi, plus their passion of running eatery businesses, by keeping up with the trend amongst young people, Phuong quickly implemented the franchise model of Gong Cha and created his own business model in Vietnam. After three years, Gong Cha has 20 outlets in big cities and is expected to have 25 outlets by the end of this year—exceeding the requirement of opening at least 15 outlets in three years stipulated by the headquarters in Taiwan. Milk tea can be considered a “fun-filled” product because the drink contains numerous chewy ingredients and savoury flavours that people, especially white-collar workers and youngsters, enjoy a lot. Previously, milk tea was just a popular drink for teenagers and students. By now, its customer base has expanded and became more diverse. Office workers and middle-aged people are now also considered the target customers of milk tea brands. Investors said that the wave of opening milk tea shops in Vietnam today is similar to the coffee shop or eateries trends of the past. Over the past few years, milk tea shops have been sprouting on almost every street. However, only foreign giants could build up a good reputation or maintain a high degree of market penetration. These brands are competing directly with each other through their store chains, such as Ding Tea, TocoToco, Chatime, ChaGo, ChaChaGo, Bobapop, Citea Fun, Blackball, Tea, Gong Cha, Koi The, T4, Tealive, Queeny or Goky, and a recent addition, Mr. Good Tea. Among them, Ding Tea is leading the race with more than 100 points of sale, followed by TocoToco with more than 60 outlets. Meanwhile, Goky has nearly 20 outlets in Hanoi and Mr. Good Tea has over 20 points of sale. Given the scale of the Vietnamese market and its growing young population, a lot of foreign milk tea and juice brands will try their luck in the coming time, heating up the battle for market share. Nevertheless, when it comes to milk tea, Taiwan is universally accepted as the “home of milk tea,” at least in Asia. This is why Taiwanese milk tea brands are confident in becoming market leaders. According to a Q&Me survey published on May 19, 2017, Ding Tea is the most popular chain of milk tea shops among respondents in Hanoi (49 per cent), followed by Toco Toco (16 per cent), and Gong Cha (9 per cent). In Ho Chi Minh City, Hot & Cold is the largest chain (22 per cent), followed by Hoa Huong Duong (14 per cent), and Phuc Long (13 per cent). However, there are also different viewpoints apart from market share. Accordingly, success arguably depends on a company’s ability to create a product that fits all tastes and still remains unique. Some people are in favour of Royal Tea Goky because of its distinctive and luxurious products. The difference is highlighted by Goky’s cream cheese milk tea—a wholly novel innovation breaking with people’s general preconception that milk tea is tea mixed with milk and pearls. Meanwhile, Japanese brand Goky is opening tea shops everywhere and are attracting a lot of customers because of their belief in the quality of Japanese tea. In addition, the astounding number of milk tea shops run by individual business households in Vietnam gives cause to worry for the main franchisees. A number of them have questioned these shops’ origins of the ingredients, since if a tea shop is found unsafe or unhygienic, it will damage the whole industry, including franchisees from abroad. The head offices of franchisors conduct unexpected inspections every year to check product quality and the operation process. In case of violations, there will be warnings and fines. If violations occur three times, the franchise license will be withdrawn. Thus, master franchise units are very cautious in implementing franchising plans in Vietnam. “Gong Cha is growing fast, but its franchising in Vietnam is limited because we want to control the quality. It is not like any investor with VND 5-7 billion ($220,260-308,370) can become a franchisee. Nevertheless, the most important criteria for choosing a franchise partner is that the owner must know how to sell the product at all cost,” Phuong said. Also, Gong Cha tends to carefully choose its franchisees based on their understanding of local conditions. For each region, Gong Cha will choose a qualified partner with adequate economic capabilities and business perspective to take charge of business expansion. Similarly, another Taiwanese milk tea brand, Tra Tien Huong, keeps the number of tea shops low and instead focuses on strengthening its brand name and controlling product quality. According to the franchisee, Tra Tien Huong will not expand in Ho Chi Minh City. Instead, the brand will focus on upgrading its reputation and target the higher-end segments to reinforce its brand name. With the dynamic growth of the economy and its young population, Vietnam appears to be a fiercely competitive market for franchised foreign milk tea brands. Apart from attempts to penetrate the market and carefully expand chains, only brands with a well-developed business plan and a captivating product will have the opportunity to survive and thrive.